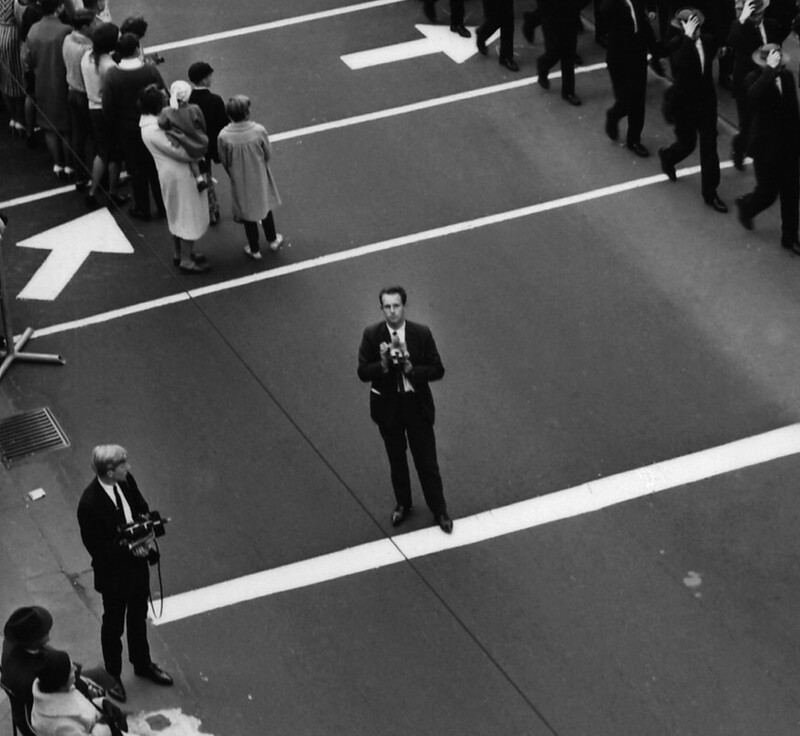 You’ll have to buy the Cloud Land catalogue to read about the history of Bob White, his camera obscura, and his telescopes — and their small but significant role in the psychogeography of Brisbane. Some things still intrigue me. 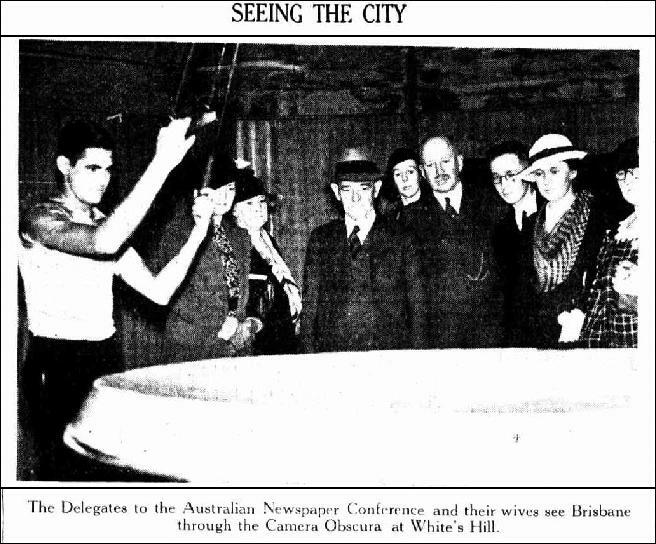 Why, for instance, in the Tele shots (which I think was the newspaper you read on the tram home from work) is the man operating the camera obscura only wearing a singlet, even though it is June, and possibly quite chilly. Is it some insolent semiotics directed to the well dressed southerners who look gingerly into the image? 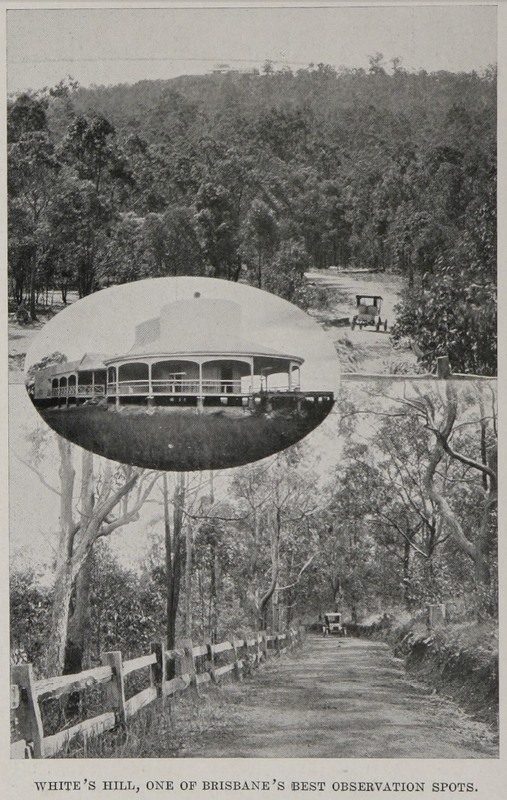 A year later, in July, the same man is dressed snugly and neatly for the visiting ramblers, who peer appreciatively into the bowl shaped image, which is duly blasted away by the flash of the Tele photographer’s Speed Graphic. As a child I think I was dimly aware of the the long-ago existence of the hilltop machine. We lived not far from Whites Hill, but it was beyond the reach of our bikes. 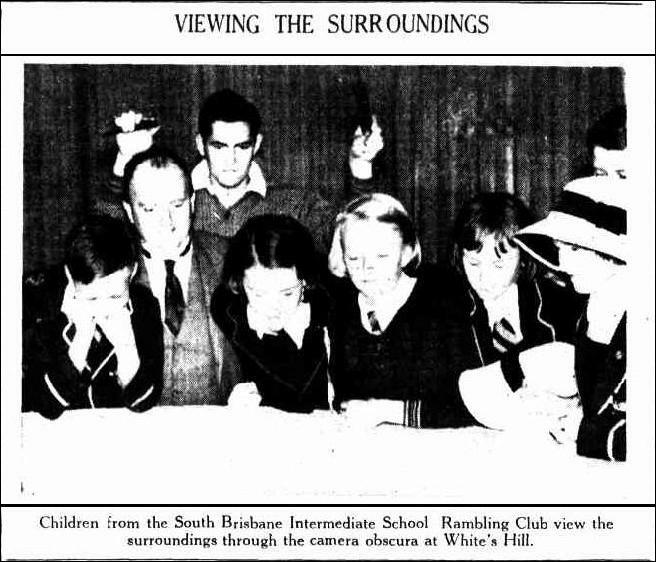 Although my father did occasionally drive us to the Whites Hill dump at the foot of the hill we never went up — but perhaps he mentioned the long-demolished camera obscura to me on the drive out, he was certainly the right age to have visited it as a kid. (Once, I remember, we brought a load of broken-up concrete pathway to the Whites Hill dump, as we over-enthusiastically under-armed the chunks from the car boot my father accidentally whacked me on the shoulder with a flat piece, he was mortified, but after the initial shock, I found myself remarkably unharmed.) The dump, chockers with rubbish culled from a thousand sixties backyards, has been smoothed over for playing fields, and is now barely a memory, less so, even, than the camera obscura. Posted on August 30, 2015 by martynjolly. This entry was posted in Blog and tagged 2015, Brisbane, camera obscura. Bookmark the permalink.